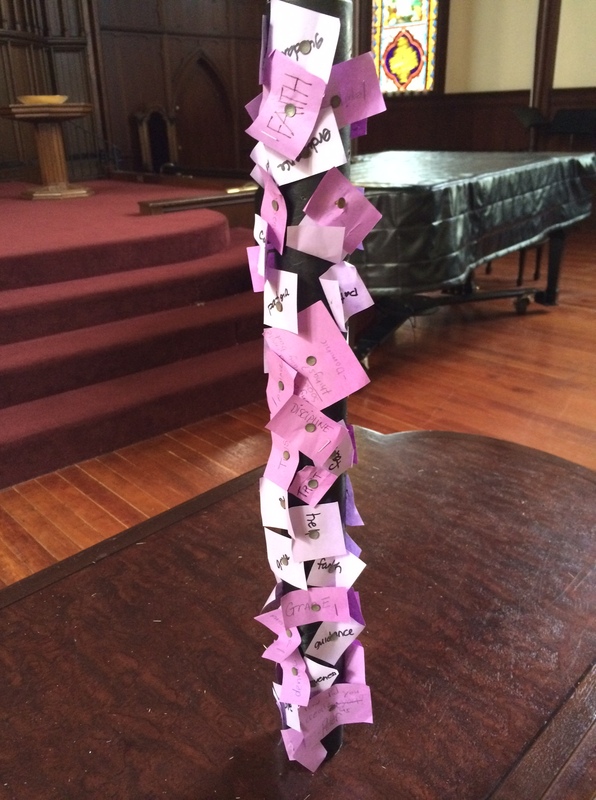 Here’s an idea to incorporate into worship. I’ve used this idea for Lent and Pentecost, but it can be adapted to any theme.
. . . a mailing tube spray painted whatever color you prefer. 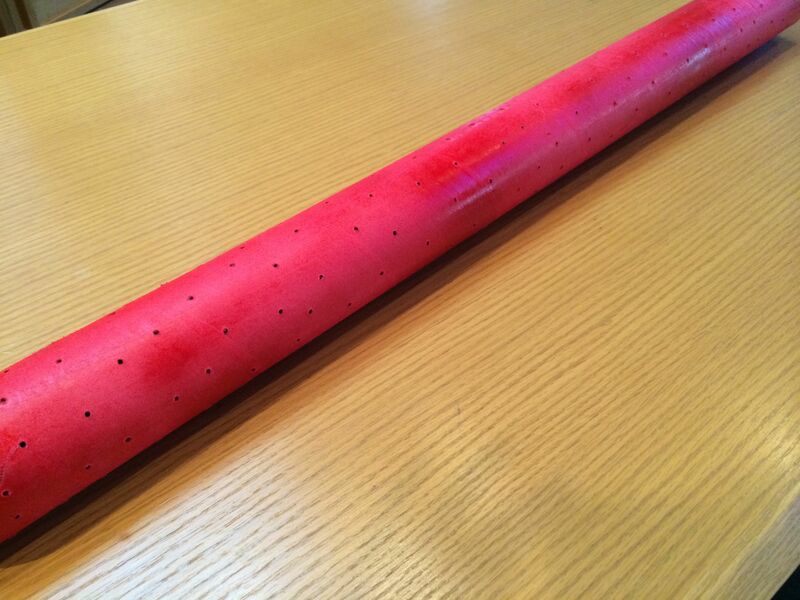 Drill at least 100 holes throughout the length of the mailing tube. 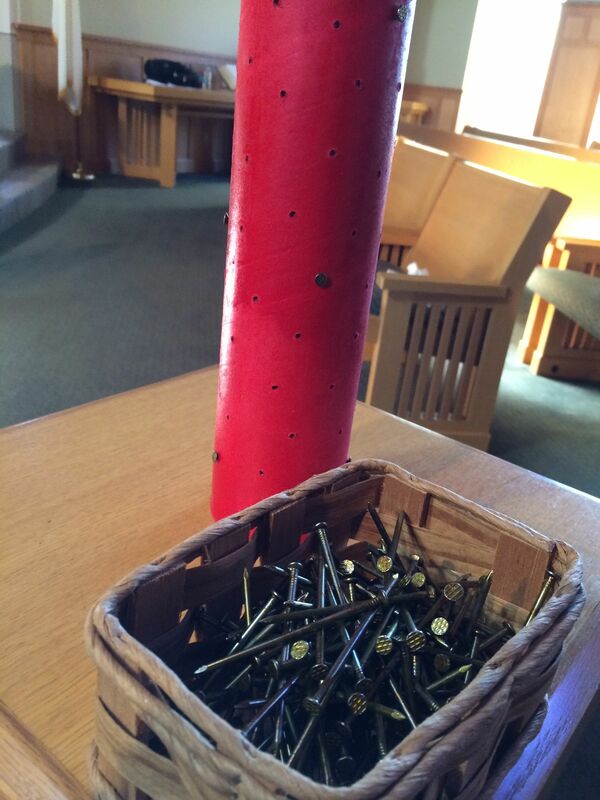 The size of the holes should be a smidge smaller than the thickness of the nail. One of the Scripture texts for the second Sunday of Lent in Year A of the Revised Common Lectionary is John 3.1-17, the story of Nicodemus. Focusing on verse 9, there is something to appreciate about Nicodemus’ resistance, unbelief, and astonishment when hearing Jesus’ promises. It is our willingness to continue to ask questions that compels us on our transformational faith journey and living into God’s promises for us. 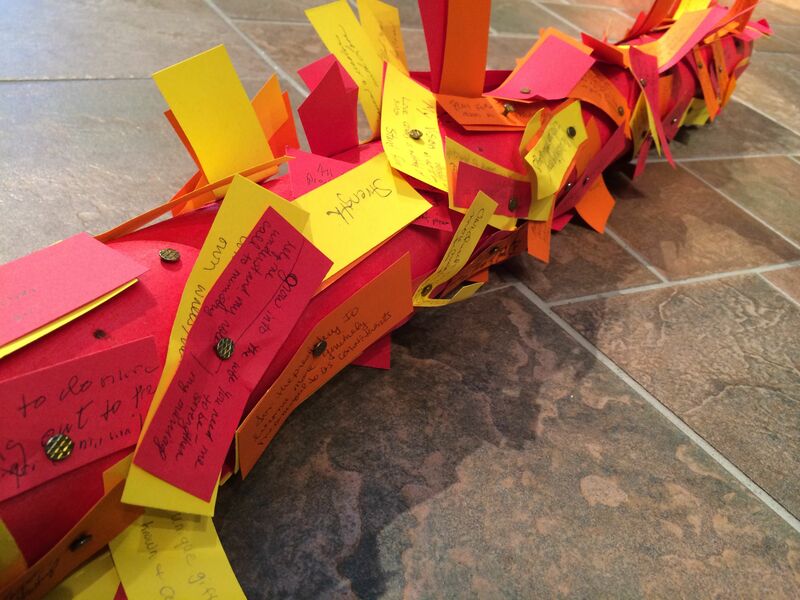 On a strip of paper, worshippers were invited to write a question or word(s) to carry them on their faith journey? These strips of paper were collected. The Scripture texts for the third Sunday of Lent in Year A is Exodus 17.1-7, Moses hitting the rock to quench the thirst of the wandering Israelites, and John 4.5-42, the story of the Woman at the Well. Focusing on how God is calling us to hit the rock and fill the well for each other and our community, each worshipper was given a small rock. They were invited to hold the rock and consider how God is calling us to be Living Water and to fill the well. Consider who is thirsty. 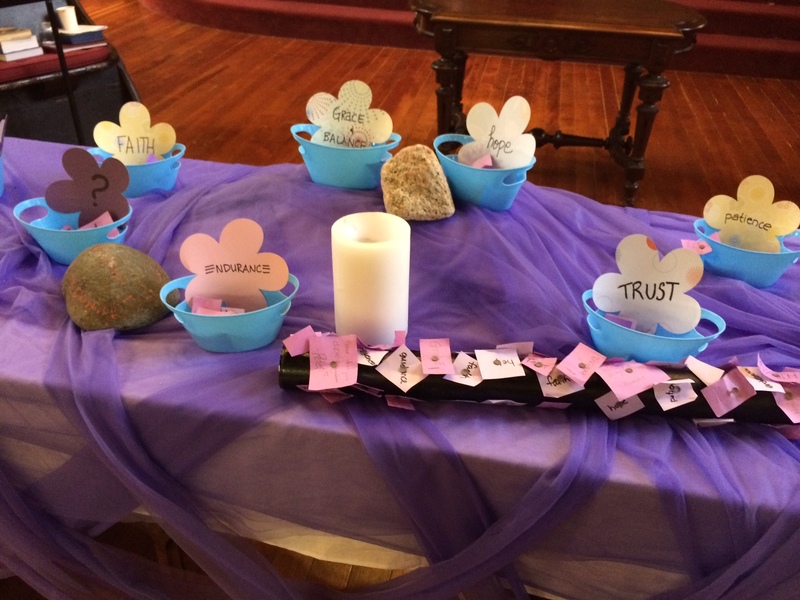 On the communion table was the baptismal bowl filled with water surrounded by large rocks. Worshippers came up and hit their small rock on the larger rocks and dropped it into the water as a gesture of their active participation to act in justice, love, forgiveness, and compassion. Combining Nicodemus’ willingness to question, the Woman at the Well sharing Living Water that only Jesus can offer, and God’s promise to carry us through even the difficult times, we have the materials of a survival pack for our own journey into the wilderness. I separated the questions and the words collected from the second Sunday of Lent into different categories. Each paper had a nail through it. 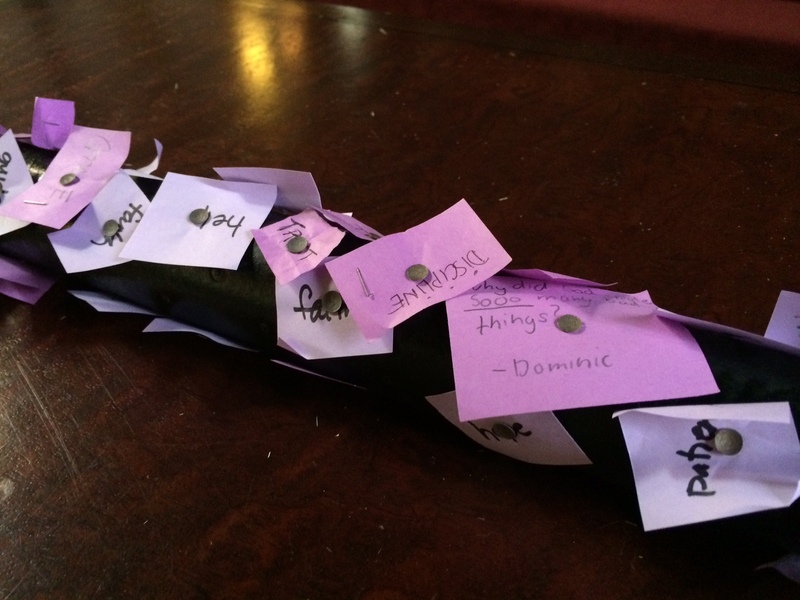 Worshippers were invited to take as many words as they wanted and stick it into the holes of the mailing tube. What words did they feel called to carry for others? The mailing tube was filled with the small rocks used on the third Sunday of Lent – the same small rocks that were put into the baptismal bowl. When all the contents were put together, it makes a rainstick, reminding us that our individual stories, needs, and calling make a collective sound . . . like water overflowing . . . Living Water flowing . . . restoring water flowing. 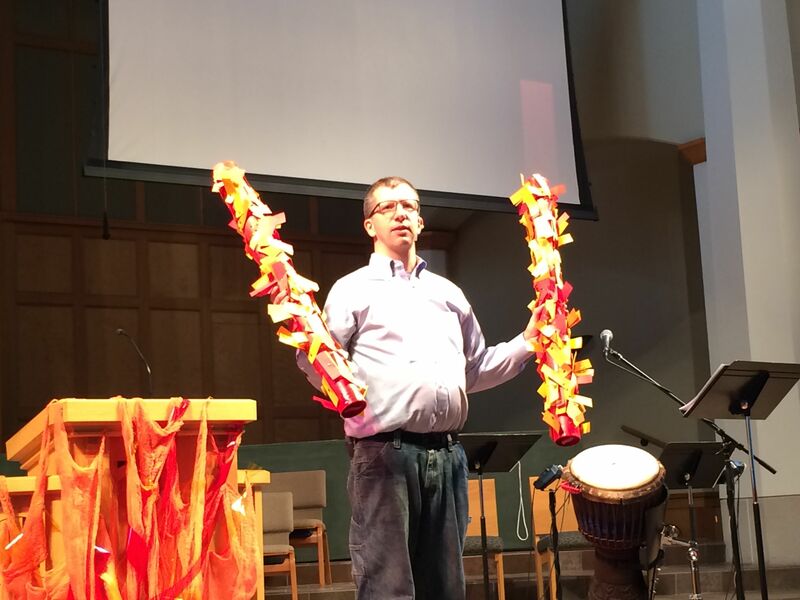 At the Presbytery of Milwaukee‘s Discovery Days, a worship-design group I’m a part of, Holy Enchilada, designed a Pentecost-themed worship. 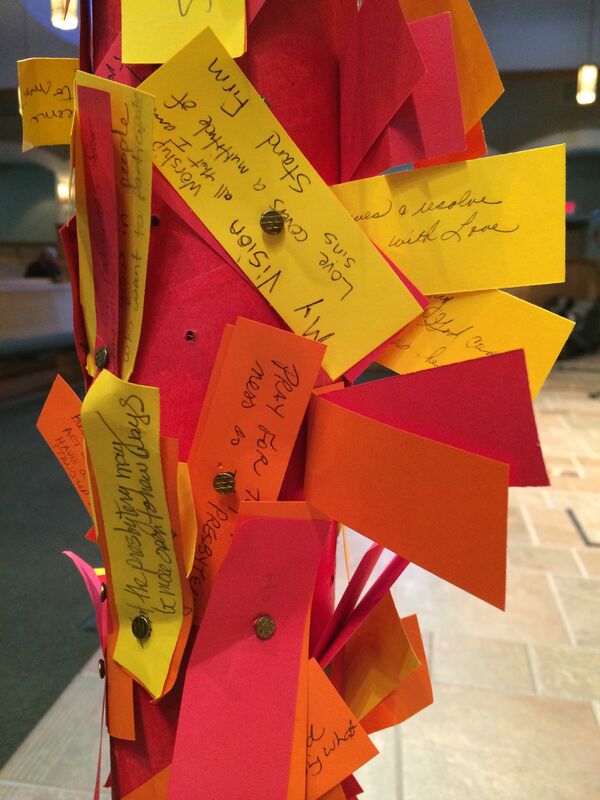 Each participant wrote a vision for themselves and a vision for the presbytery. They were invited to nail their pieces of paper to the mailing tube. Focusing on Acts 2 where people started to speak in other languages and yet everyone understood each other, the rainsticks were given to the moderator and vice-moderator so that every time they heard the sound, they were reminded that we all are the presbytery sharing our individual and collective vision.